Let’s try to install UDTalk! UDTalk is a communication application. You can use it to communicate to deaf people and people with hard of hearing. In addition to that it can be used for communication between people that speak different languages. This app has functions such as speech recognition, automatic translation, connecting devices and other convenient functions. Using speech recognition provides subtitles for your conversation & conference . Using automatic translation can help you join the events, make your trip abroad more enjoyable, and help you study the language. 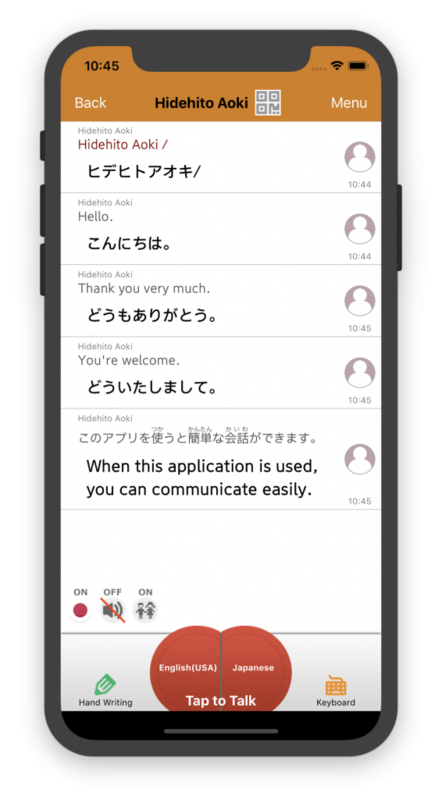 Once you download this app you can start a chat between multiple parties and use it as a translation chat app. It is especially beneficial with Japanese language, as it uses Kanji characters. It is too difficult for non-Japanese people and for little Japanese children. UDTalk can assist in reading characters instead of showing characters alone. Maybe it is not a perfect way to communicate, but it will offer you a great assistance to express yourself correctly. This app’s business plans are used by many companies, educational institutions and organizations in Japan. App’s free version had over 160.000 downloads (until the end of 2017). Usage is very simple. After installing and agreeing to licence, only tap “Tap to talk” button. Left-side button (for example “English(USA)”) is your chosen language, and right-side button (for example “Japanese”) is partner’s language. You can select partner’s language by holding the “Tap to Talk” button. If you want to choose your own language, you have to go back to the top and enter settings and tap “User’s language settings”. After tapping, you can start speaking to this app. When you finish with speaking, you have to tap to stop speech recognition. Translation is automatic. Using the left bottom side 3 buttons you can select translation status, speech generation and Japanese reading. Let’s try using this app!